The components of the extrinsic factor Xase enzyme complex are illustrated. 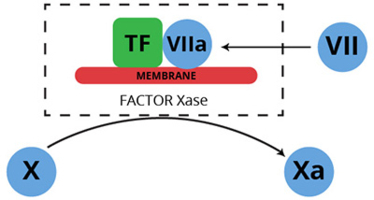 Factor VIIa and its cofactor tissue factor (TF) assemble on a negatively charged membrane surface in a calcium dependent manner to form an enzyme complex which proteolytically converts factor X to factor Xa. The complex is referred to as the extrinsic factor Xase complex, because the tissue factor component is presumably derived from a source "extrinsic" to the plasma environment, which is accessible following vascular injury. Human factor VII is a single chain plasma glycoprotein, and is a zymogen in its native form (1-4). Proteolytic activation of factor VII, yields the enzyme factor VIIa, which when bound to the integral membrane protein tissue factor, forms an enzyme complex that proteolytically converts factor X to factor Xa. This enzyme complex is best known as the extrinsic factor Xase (pronounced ten-ase) complex, since by virtue of its tissue factor component, it is composed of protein normally extrinsic to the plasma environment. The conversion of factor VII to factor VIIa is catalyzed by a number of proteases including thrombin, factor IXa, factor Xa, factor XIa, and factor XIIa. Rapid activation also takes place when factor VII is combined with tissue factor in the presence of calcium (5-9). This latter event is consistent with autocatalysis, and is likely initiated by a small amount of pre-existing factor VIIa. The activation reaction results in cleavage of the peptide bond between arginine 152 and isoleucine 153. The resulting factor VIIa consists of an NH2-derived light chain (Mr=20,000), and a COOH-terminal derived heavy chain (Mr= 30,000), which remain associated through a single disulfide bond (cys 135 - cys 262). The light chain contains the membrane binding "Gla domain", while the heavy chain contains the catalytic domain. Unlike other serine proteases, factor VIIa alone is not readily inhibited by the antithrombin III/heparin complex. However, in the presence of tissue factor, antithrombin III/heparin exhibits significant inhibition of factor VIIa (6). Human factor VIIa is prepared from affinity purified factor VII, and purified by ion exchange chromatography. The purified protein is supplied in 50% (vol/vol) glycerol/H2O and should be stored at -20°C. The purity is determined by SDS-PAGE analysis, and activity is measured in a factor VII clotting assay. Enzyme component of the extrinsic factor X activating complex; also activates factor IX, thus by-passing the contact activation system. Broze, G.J. and Majerus, P.W., Methods Enzymol., 80, 228 (1981). Williams, E.B., et al., J. Biol. Chem., 264, 7536 (1989). Kisiel, W. and McMullen, B.A., Thrombosis Res., 22, 375 (1981). Radcliffe, R. and Nemerson, Y., J. Biol. Chem., 250, 388 (1975). Lawson, J.H.,et al., J. Biol. Chem., 268, 767 (1993). Kisiel, W., et al., Biochemistry, 16, 4189 (1977). Radcliffe, R., et al., Blood, 50, 611 (1977). Seligsohn, U., et al., J. Clin. Invest., 64, 1056 (1979).